Sugartown Pediatrics (Malvern) - Book Appointment Online! 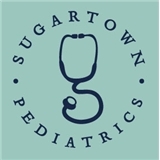 Sugartown Pediatrics is a private medical practice dedicated to the health of children and young adults from birth through age 26 years. It is unique as a solo practice founded by Louis Giangiulio, MD, a locally raised physician who attended Jefferson Medical College and received world-class training through his service with the US Army. Your children will benefit from Dr. G.'s board-certified pediatric qualifications, unparalleled accessibilty, and experience as a father of four himself. He accepts most major insurances and is now accepting new patients. Always a pleasure seeing Dr. G.